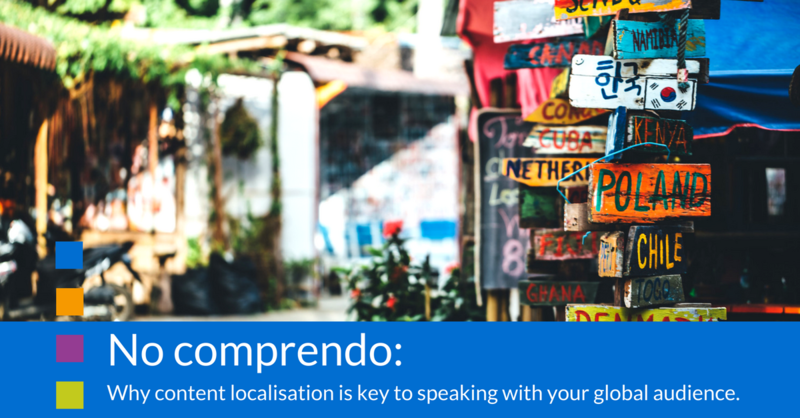 No Comprendo: why content localisation is key to speaking with your global audience. You’re no doubt familiar with the principle of delivering the right message, to the right people at the right time. Its sound advice, but what’s missing? The need to deliver the right message, in the right language. It’s no secret that to talk to your audience, you need to speak their language. Yet, how much of your content is limited to the English-speakers within your target audience? How many existing and potential clients, across EMEA and beyond, are you missing the chance to talk with, as a result? It’s not just about translating your content. To pack the same punch across different regions, it needs to be localised – it needs to reflect the differences in the way people live and work, including their customs, idioms and cultural references. Should you use the formal or informal ‘you’ in a language where both forms exist? Will everyone be familiar with recent news headline you mention in your article? Will your foreign audience need some extra background information to understand the subtleties of your case study with a British client? Accounting for these kinds of differences means that you’re not only speaking their language, you’re retaining the impact in what you say. IT solutions provider, Barracuda, is a great example of a B2B brand that’s benefitting from far greater engagement with their European audience. Their critical monthly newsletter, originally delivered in English with no content variation, is now localised — distributed in six languages, with unique content for each region. This move has seen unique open rates rise by 39% and unique click-through rates by 75%. This just goes to show how content localisation can help you fuel conversations with your audience and lay the foundations to nurture valuable relationships. To best fuel conversations with your audience across different regions, you need to deliver the right message, in the right language. Click here to find out more about Barracuda’s success with content localisation. Subscribe to HN reload to keep up to date with our latest content marketing thoughts, ideas and insights to help you fuel the conversations that build your audience relationships. What type of video content should I make? How can video increase the effectiveness of your content marketing?